Thảo luận trong 'Nghiên cứu phân tích học thuật' bắt đầu bởi kiên, 16/5/14. On May 1st 2014, Vietnamese authorities discovered China National Offshore Oil Corp.'s drilling rig namelyHaiyang Shiyou 981 (HD981) and 03 oilvessels of China moving from the Northwestto the South of Tri Ton Island (Paracel islands of Vietnam). By 16:00 on May 2nd 2014, HD981 rig anchored in the South of Tri Ton Island along with 27guardships. China continued to deploymore guard ships to this area in the following days. On May 3rd 2014, ChineseMaritime Safety Administrationissued a shipping notice No.14033 on its website, saying that: From May 2nd to August 15th 2014, HD981 rig will conduct exploratory drilling within one-nautical-mile-radiuswatersof15029’58” North latitude - 111012’06” East longitude and all vesselsarebanned from entering this area. Afterwards, on May 5th 2014, Chinese Maritime Safety Administrationreplaced shipping notice No.14033 with notice No.14034 regarding the expansion of exploratory drilling scope up to 03 nautical miles, from 15029’58” North latitude to111012’06” East longitude,and again, it banned all vessels from entering this area. The location of HD981rig mentioned in the notice of ChineseMaritime Safety Administration is totally within the Exclusive Economic Zone andcontinental shelf of Vietnam, about 120 nautical milesfrom Ly Son island of Vietnam. This action is part of China’s recent escalations in the South China Sea, such as: official claims of the “nine-dash line”(May 2009); cutttingof “Binh Minh II”and “Viking II”ships’ cables (May and June 2011); establishment of "Sansha City" (June 2012); unilateral ban on annual fishing in the South China Sea;implementationof “measures toenforce“Fishery Law of the People’s Republic of China”(entering into force since January 1st2014);launch of patrols and military exercises in the South China Sea to show offitspower and deter other claimants;enhancement of oil exploration, archeology, development of tourism and consolidation of facilities in disputed areas;attacks on Vietnamesefishing vessels, etc., in an increasingly overt manner, regardless of international criticism and laws.In addition, China also claims that it has “absolute right”to establishanAir Defense Identification Zone in the South China Sea. Thus, China’s recent activities in the South China Sea, especially the deployment of HD981 rig in Vietnam’sExclusive Economic Zone and continental shelf, is deliberate and carefully calculated to “monopolize the South China Sea”and to realize its “nine-dash line”claims; willing to use every available means, regardless of international criticism and laws, in order to claim its sovereignty in the South China Sea, which intensifies tension and risk ofuncontrolled conflicts,and severely threatenssecurity, safety, peace and cooperation in the South China Sea. Vietnam has sufficient historicalevidence and legalgroundsto prove itssovereignty over the Paraceland Spratly islands. Vietnam’s territorial acquisition inthe Paracel and the Spratly Islandswas based on“principle of effectiveness”:Vietnam is the first countryever to occupy and exercise sovereignty over theParacel and Spratly Islands when they wereunclaimed (res nullius) at least since the 17th century. Theoccupancy and exercise of sovereignty is real, continuous, peaceful and obvious. Vietnam hasfull legal grounds and historical evidence toprove and defend its legitimate sovereignty, which meets all requirements of “principle of effectiveness”. a. Dai Viet State under the Nguyen Dynasty: Established the Paracel unit togovern, defend and exploit the Paracel and Spratly Islands. The Paracel unit andthe North Seaunitestablishedafterwards under the control of theParacel unit hadoperatedunder the command of the seven lords, from Lord Nguyen Phuc Lan orNguyen Phuc Tan until the Tay Son rebellion. b. Dai Viet State in the Tay Son period: Despite constant wars on the groundand in the South China Sea,from 1771 to 1801, the forces of Lord Nguyen, Lord Trinh and Tay Son still exercised sovereignty over the territories under theirgovernance, including the Paracels and Spratlys. c. Vietnam State under Nguyen Dynasty continued to demand theParaceland the North Sea unitsto exploitand defend theParacel and Spratly islands.Afterdefeating Tay Son Dynasty and unifying the country,Nguyen Anh continued topay attention to protection, governance and exploitation of Paracel and Spratly islands despite various domestic affairs. Under the 1884 Patenotre Treaty, French colonial Administrationrepresented Vietnam to defend, govern and claimVietnam’s sovereignty overParacel and Spratly islands. In late 1946, early 1947, in spite of Vietnam’s independence declaration on September 2nd 1945 and freedom from the 1884 Patenotre Treaty, France asserted that under the Preliminary Treaty on March 6th 1946, The Democratic Republic of Vietnam remainedunder controll of the French Union.Thus, Vietnam remained dependent on France diplomatically and France continued to exercise its right in representing Vietnam tocountereveryviolation of Vietnam’s sovereignty overParacel and Spratly islands. Under the Treaty on March 8th 1949, France establishedpro-French government, which was called The State of Vietnam and washeaded by former Emperor Bao Dai. However, it was the French army who reallyruled the South China Sea, including the Paracel and Spratly Islands. Geneva Agreement signed on July 20th 1954recognized Vietnam’sindependence, sovereignty, territorial integrity and unity. Aticle 1 of Geneva Agreement stipulated that Ben Hai river was chosen as a temporary demarcation line (known as Parallel 17th) in order to divide the territorial jurisdiction betweenthe North and the South of Vietnam. This temporary demarcation line was also extended offshore from the coast (Article 4). Paracels and Spratlys located belowParallel 17th therefore theywereunder the governance of the Government of South Vietnam. Under the guideline of the Politburo and directive of the Commander in chief of Vietnam’s People’s Army, Vietnam’s People’s Navy Commander tookoverthe Paracels. From April 13th – 28th 1975, Vietnam’s People’s Forces tookover islands occupied by the forces of Democratic Republic of Vietnam and deployed soldiers to defend some other islands of the Paracels. On December 9th 1982, the Government of the Socialist Republic of Vietnam signed the Decision No.193-HĐBT on the establishment of Truong Sa (Paracels) District of Dong Nai Province. On December 11th 1982, Vietnam Government signed the Decision No.194-HĐBT on the establishment of Hoang Sa (Spratlys) District of Quang Nam-Da Nang Province. On December 28th 1982, under a Resolution of the 7th National Assembly of the Socialist Republic of Vietnam, Truong Sa District was integrated into Phu Khanh Province. - Truong Sa Town: includes the large Spartlys Island and its vicinity. - Song Tu Tay Commune: includes Song Tu Tay Island and its vicinity. - Sinh Ton Commune: includes Sinh Ton Island and its vicinity. On July 1st 1989, Phu Khanh Province was seperated into two smaller provinces: Phu Yen and Khanh Hoa. Truong Sa District belongs to Khanh Hoa Province. On June 23rd 1994, the 1982 UN Convention on the Law of the Sea was approved by the National Assembly of the Socialist Republic of Vietnam. On January 1st 1997, Quang Nam-Da Nang Province was seperated intoQuang Nam Province and Da Nang city, a Central city.Hoang Sa District belongsto Da Nang city. 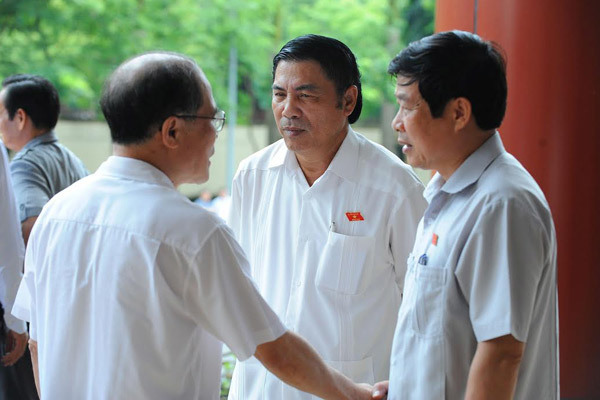 On April 25th 2009, Da Nang Administration appointed Mr. Dang Cong Ngu as Chairman of the People’s Committee of Hoang Sa District. So far, in addition to the above activities, Vietnam has been occupying and governing 21 islandsofthe Spratlys; constantly consolidated and developed socio-economic, security and defense facilities in Truong Sa District. - The United States: U.S. Politicians (State Department Spokesperson Jen Psaki; U.S Ambassador to the Philippines Goldberg; Assistant Secretary of State for East Asian and Pacific Affairs Danny Russel, etc.) have reiterated U.S stance and perspective on the issue: (i) U.S has, for the first time, shifted from insinuating to publicly criticizing China for its “nine-dash line” claims in the South China Seawhich are inconsistent with international laws; saying lack of transparency in China’s claims may result in regional instability and insecurity; (ii) U.S has responded quickly and bluntly to China’s actions, regarded such actions as “provocative and risky”, saying China’s assertive and provocative moves in order to pursue its claims are unacceptable”. - The Philippines (PLP):has been reiterating its increasingly tough stance against China’s escalations in the South China Sea: (i) In response to Hainan’s new fishing regulations, the Philippines has kept protesting through different channels and askingChina to clarify these regulations; saying that it violatesInternational laws and escalates tensions in the South China Sea; affirming that the Philippineswill not approve these regulations; (ii) The Foreign Ministry of the Phillipines also defined that the China’s“nine-dash line” in the South China Sea completely vilolatesinternational laws and threatens regional peace and stability; stating that the “China’s Exclusive Economic Zone is not allowed to exceed 200 nautical miles from its mainland and Hainan Island”; (iii)The Philippines determinedly pursuesitslawsuitagainst China at the international arbitration court of the law of the sea. - Malaysia:Among the claimants in the South China Sea, Malaysia usually tends to avoid publicly criticizing China, even though China has 3-times sent its vessels to James reefs, 80km off Malaysia’s coast. Nevertheless, in response toChina’srecent escalations in the South Sea, Malaysia has expressedtougher stancesuch as: (i) For the first time, Malaysian Prime Minister Najib Razak (September 2013) stated that China “had sent a mixed message” whichgave Asian neibouring countries a negative view of China; China should solve maritime disputes with other ASEAN countries in “a more friendly way”; (ii)Malaysia refused China’sproposal of bilateral negotiations, “collaboration to exploit together” during the visit to Malaysia by the President Xi Jinping (Oct 2013); (iii)Malaysia declaired to build a new naval base in Bintulu, Sarwak (the largest town, 96 km off James reefs)... Notably, in the closed Conference of Foreign Ministers of ASEAN countries (on Jan 16th -17th 2014) in Myanma, Malaysia stance over the South China Sea had changed dramaticallyin comparision with those in the past, in which Malaysia had strongly protested to the enforcement measures of FisheryLaw of Hainan; suggesting ASEAN countries to have appropriate responses to China's activities; did not accept the "setting aside dispute and exploiting jointly” guidelines of China; suggesting ASEAN and China to conclude COC. - Indonesia:Indonesian Foreign Minister has protested China ADIZ on theSouth China Sea; expressed its concerns that the “Nine-dash line” is overlapping Natuna Islands’ Exclusive Economic Zone; actively raised issues related to thedisputes in the South China Sea at the closed Conference of Foreign Ministers of ASEAN countries in Myanmar (Jan 16th-17th 2014), urged the conclusion of COC. - Japan: Japan's Defense Minister (Jan 12th) objected to “enforcement measures of Fishery Law of Hainan", saying that the unilateral imposition of such fishing restrictionin waters as if this warters belongs only to China is unacceptableinternationally; and that China is a threat to the current international order." - Vietnam strongly opposes China’s above action and firmly requests CNOOC to stop its illegal operations and remove HD981 rig out of Vietnamese waters. - China’s above action goes against the cooperative spirit between the national oil and gas groups of both countries, the practice of international oil and gas activities as well as friendly and cooperative principles between Vietnam and China. - Restrain, go to great length to maintain peace and stability, refuse to use force or coercion, strictly obbey UN Charter and international legal standards including 05 principles on peaceful coexistence, the 1982 UN Convention on the Law of the Sea; fully implement the Declaration on the Conduct of Parties in the South China Sea (DOC) and ASEAN Six-point principle on the South China Sea(2010), conclude a Code of Conduct in the South China Sea (COC) in a timely manner. - Persistantlypursue peaceful solutions to sovle the disputes, in accordance with international law; respect freedom of navigation and put concerted effort to securing safety for ships through the South China Sea in keeping with the 1982 UN Convention on the Law of the Sea; enhance cooperation on sea safety and research, environment protection, disaster relief at sea, maritime crime prevention which contributes to trust building. (Tin Nóng) Báo Washington Post (Mỹ) ngày 16.5 có bài viết kêu gọi chính phủ Mỹ có biện pháp mạnh mẽ hỗ trợ Việt Nam đối phó hành vi hung hăng của Trung Quốc trên Biển Đông, như gia tăng sự hiện diện hải quân và cấm tập đoàn dầu khí CNOOC hoạt động tại Mỹ. Bài báo này của hai tác giả Elizabeth Economy và Michael Levi (thuộc Hội đồng Đối ngoại, một tổ chức phi chính phủ), cho rằng những hành động của Bắc Kinh trên Biển Đông gần đây đòi hỏi Mỹ phải có biện pháp đáp trả. Theo hai tác giả, tập đoàn dầu khí Hải Dương Trung Quốc (CNOOC) đưa giàn khoan Haiyang Shi You 981 (Hải Dương 981) vào vùng biển Việt Nam, đi kèm hơn 70 tàu các loại của chính phủ, kể cả tàu chiến. Những gì đang diễn ra trên vùng biển này là nguy hiểm hơn so với từ trước đến nay. Mỹ cần đối diện với mức độ đầy đủ từ những thách thức của Trung Quốc để có thể đối đầu thành công. Điều này có nghĩa không chỉ đàm phán gay go mà cả sự sẵn sàng có hành động khó khăn. Theo đánh giá của Trung Quốc, Biển Đông có trữ lượng dầu khí 400 tỉ thùng dầu, vượt xa khu vực Trung Đông. Còn Mỹ đưa ra con số khiêm tốn vào năm 2010 là 11 tỉ thùng. Khó tin rằng Trung Quốc sẵn sàng cho đối đầu quân sự chỉ để giành lấy nguồn tài nguyên không lớn lao này. Hai động lực thúc đẩy Trung Quốc ở Biển Đông là Hoàng Sa và quyền kiểm soát hàng hải. Quần đảo Hoàng Sa của Việt Nam nằm cách bờ biển Việt Nam 120 hải lý, và nằm trong vùng đặc quyền kinh tế 200 hải lý của Việt Nam. Nhưng Trung Quốc nói họ có chủ quyền quần đảo này từ ngàn xưa và đã dùng vũ lực đánh chiếm vào năm 1974. Trung Quốc dùng việc kiểm soát quần đảo này để củng cố quyền lực lãnh đạo trong nước. Động lực thứ hai là Trung Quốc muốn kiểm soát tuyến hàng hải qua Biển Đông, nơi có lượng hàng hóa qua lại trị giá hơn 5.000 tỉ USD/năm, nơi có 1/3 lượng dầu khí thương mại thế giới qua lại và hơn 3/4 lượng dầu khí nhập khẩu của Trung Quốc. Hải quân Trung Quốc quá yếu trong việc thách thức hải quân Mỹ vốn thống trị các tuyến hàng hải ở Trung Đông, thậm chí ở eo biển Malacca, nhưng hải quân Trung Quốc hoạt động khắp Biển Đông tạo cho Trung Quốc niềm tin rằng Mỹ khó mà làm gián đoạn nguồn cung cấp của Trung Quốc. Bằng cách che đậy tham vọng quân sự của mình dưới chiêu bài thương mại (khai thác dầu khí), Bắc Kinh có thể hy vọng xoa dịu một số phe đối lập không thể tránh. Tuy nhiên những hành động mới nhất của Trung Quốc đã làm ngạc nhiên cho Việt Nam và các nước, làm suy yếu khẳng định lâu nay của Bắc Kinh về quan hệ vững chắc với các nước trong khu vực là ưu tiên hàng đầu trong chính sách đối ngoại của Trung Quốc. Mỹ luôn nói không đứng về bên nào trong các tranh chấp chủ quyền và kêu gọi hai bên giải quyết tranh chấp bằng biện pháp hòa bình. Điều này là chưa đủ: Mỹ phải lên án sự giả dối của Trung Quốc và thể hiện rõ vị trí của mình. Mỹ và ASEAN nên cùng trong một mặt trận thống nhất trong việc bác bỏ những hành động đơn phương về đòi hỏi chủ quyền ở những vùng lãnh thổ tranh chấp. Quan trọng hơn, Mỹ phải chuẩn bị để tạo nên sức sống cho vị trí lâu nay chỉ nói suông. Dù Mỹ không có hiệp ước bảo vệ Việt Nam, nhưng chính sách tái cân bằng ở khu vực châu Á chính là tiền để để Mỹ đóng vai trò người bảo hộ chính cho bình ổn ở châu Á - Thái Bình Dương. Những hành động của Trung Quốc đang thách thức điều này. Việt Nam đã tái khẳng định cam kết giải quyết hòa bình các tranh chấp. Nếu Trung Quốc không đáp lại, Mỹ cần phải chuẩn bị để cung cấp hỗ trợ cho Việt Nam thông qua gia tăng sự hiện diện của hải quân. Điều này sẽ giúp Washington khả năng đánh giá năng lực của Trung Quốc và để làm giảm căng thẳng. Những cách khác gồm cấm đoán các hoạt động của tập đoàn dầu khí CNOOC tại Mỹ cũng cần được xem xét. Bài báo kết luận rằng, nếu Mỹ không thực hiện lời nói đi đôi với hành động, thì uy tín của Mỹ trong việc hứa hẹn duy trì hòa bình và ổn định trong khu vực sẽ bị phá hủy từ bên trong. - ngoan ngoãn thì anh cho qua bình thường, nếu chú mà tý tởn quá đáng thì kiếm đường khác đi là vừa. - đừa à. chữa cháy cũng phải hướng dẫn nữa. Người Mỹ đã giúp đỡ chúng ta rất nhiều mà. Trong giai đoạn đầu thành lập Mỹ đã giúp đỡ cảnh sát biển Việt Nam một khóa đào tạo hơn 15 tuần tại Norfolk, việc Việt Nam có thể kí kết với Damen sản xuất hàng loạt các loại tàu lớn cũng có sự trợ giúp quốc tế. Còn bạn nào chưa biết thì kỹ thuật chữa cháy trên các khí tài chiến đấu rất phức tạp, hiện tại hàng năm thủy thủ nhà ta vẫn học các kỹ năng chữa cháy, sửa máy, y tế với hải quân Mỹ, Úc và Ấn Độ. Cho vài con tàu cũ để việt nam húc cho khỏe. Lợi dụng tình hình thế giới có nhiều biến động, đặc biệt có sự ủng hộ ngầm của Nga, TQ đang áp dụng chiến thuật tác chiến "Tằm Ăn " trên biển đông, việc TQ đặt giàn khoan này có lợi gì cho TQ ? có hại gì cho VN ? tôi sẽ có vài dẫn chứng cho mọi người ở bên dưới. + Đặt giàn khoan đó để buộc VN thương lượng Song Phương, việc này giúp TQ hợp pháp hóa chủ quyền của họ. + Vì đây là giàn khoan di động nên TQ có thể tiến từng hải lí vào sâu trong lãnh hải VN đúng như cách con tằm ăn 1 cái lá, gặm từ từ cho để khi khớp với đường 9 đoạn của họ, VN gọi là đường lưỡi bò. + VN sẽ bị thiệt hại nhiều nhân mạng trên biển cùng nhiều tàu thuyền, nếu cứ di trì hoạt động chống lại khiêu khích của TQ. + Kinh phí di trì hoạt động trên biển phải huy động toàn bộ lực lượng quan sát hoạt động của TQ cũng khá tốn kém cho VN, khi mà tiềm lực kinh tế VN có hạn chế, sau 1 thời gian dài thấy VN không thể cầm cự nổi TQ sẽ yêu cầu đối thoại song phương, hoặc phía VN liên lạc đối thoại song phương. + Trên đất liền nội bộ bất ổn, nghĩ rằng chính quyền VN nhu nhược, nhiều phần tử có thái độ quá khích, dẫn đến thiệt hại kinh tế VN trầm trọng nếu như TQ không rút giàn khoan về sớm, tâm lí các nhà đầu tư họ sẽ chọn những quốc gian an toàn hơn để bảo toàn vốn của họ, nếu như căng thẳng kéo dài quá lâu, 1 khi các doanh nghiệp nước ngoài thoái hết vốn hoặc di chuyển nhà máy sang các quốc gia khác, thì ở VN tình hình thất nghiệp tăng cao, tỉ lệ nghèo đói tăng lên lúc đó buộc người dân phải làm loạn hơn để buộc chính quyền đáp ứng nhu cầu cuộc sống của họ, với quy mô diện rộng thì chính quyền VN khó chống đỡ nổi, nội bộ VN bất ổn là lúc TQ chiếm đóng ngoài khơi, trong khi trong nước bình định xong thì nội lực cũng không đủ sức chống lại TQ, chỉ còn cách nhượng bộ chấp nhận chủ quyền của TQ. + Nếu VN vượt qua khủng hoảng lúc này VN sẽ có uy tín trên toàn thế giới, lúc đó vốn đầu tư sẽ đổ vào VN nhiều hơn, và trong 5 - 10 năm kinh tế VN thừa sức qua mặt TQ, bởi khi TQ không đạt mục đích, rút giàn khoan về thì nội bộ TQ sẽ bất ổn, bên trong sẽ có nội chiến gây thiệt hại kinh tế và cơ sỡ hạ tầng của họ, chắc chắn VN sẽ trở thành môi trường đầu tư lí tưởng thay thế cho TQ trong tình hình đó, nhưng liệu VN có khả năng kiềm chế đủ lâu để TQ phải nhượng bộ rút giàn khoan hay không ? câu hỏi này có lẻ khó có ai đoán trước được. + Xấu nhất có thể xảy ra, TQ sẽ làm liều phá vài cơ sở hạ tầng trên bộ của VN để làm kinh tế và nội bộ VN bất ổn, như tôi đã viết bên trên, nhưng tình hình này sẽ đấu tranh vũ trang phá hoại kinh tế VN nhằm làm chậm độ phát triển VN, để VN phải phụ thuộc họ. Điều tôi có thể tin tưởng ra trong 5 năm tới VN sẽ có ít nhất 2 cảng biển mang tầm quốc tế, và sẽ thay thế cảng biển đầy bất ổn của TQ, nếu như bây giờ chính quyền VN có cách làm yên lòng dân đúng cách. Nếu dân tộc VN có thể thống nhất không có phản động không có đối đầu với nhau, tất cả chung 1 lòng vì mục tiêu phát triển đất nước thì VN sẽ trở thành Israel thứ 2 ở Đông Nam Á.
Khả năng đụng độ trên biển rất cao vì hiện giờ TQ như con C.H.Ó điên sắp cắn càn.Bản chất ngạo mạn,tự tin vào vũ khí khủng rồi sẽ bị VN đập cho nát xác thôi.Thêm 1 trên Bạch Đăng Giang trên biển thì TQ mới thấm. thanhvien và hoangtusamac170 thích bài này. Cân não gì đâu, ông thớt rảnh quá à.
Tăm ăn tơ mới tờ ăn tăm cái con khỉ gì. Đảo của mình thì nó chiếm rồi, dàn khoan nó cắm rồi, xây xong Hoàng Sa giờ nó quay sang xây Trường Sa. Chẳng mấy mà nó cắm thêm vài cái Haiyang 981 ( đề nghị ghi rõ là Haiyang 981 chứ HD 981 là cái mẹ gì?) thì ăn cám. Nói thẳng ra Việt Nam chỉ có thể gây áp lực để Trung Quốc rút giàn khoan. Mà đằng nào Trung Quốc cũng sẽ rút sau 3 tháng theo như tuyên bố của họ. Giờ Việt Nam mang tàu CSB hay tàu Kiểm Ngư ra cũng chỉ tạo ra tình thế tranh chấp, bảo vệ chủ quyền và cũng lấy bằng chứng để tố cáo hành vi ngang ngược của Trung Quôc chứ những tàu đó làm sao đọ nổi tàu của bọn chúng. Nhìn chung khả năng chiến tranh không cao. Cái mà ta cần làm là phải phát triển được kinh tế. Kinh tế ta phát triển 5%/năm, của TQ là 10%/năm. Vậy sau tầm 10-15 năm nữa, nếu trong hoàn cảnh tương tự thì không phải là 130 tàu mà là 260 tàu của Trung Quốc. Nếu chiến tranh xảy ra thì liệu ta có cơ hội chiến thắng không? Rất khó. Có vấn đề về nhận thức mới vác chỉ số kinh tế ra đánh giá sức mạnh quốc gia bạn ạ. Nhà Thanh có GDP = 1/6 thế giới cuối cùng cũng bị tiêu diệt. Trung Quốc ngày nay chưa chiếm được GDP 1/6 thế giới, hải quân chưa mạnh nhất thế giới nên chưa ăn thua. Thật ra người Việt Nam mình hiền, mà cái chính là các lãnh đạo ngồi trên kia sợ mất ghế chứ giả sử nếu Việt Nam bắn rụng dàn khoan thì sao nào? Trung Quốc vi phạm nghiêm trọng chủ quyền Việt Nam, chống lại luật quốc tế, lại ngăn cản Việt Nam chấp pháp, trong sứ mệnh đó hải quân Việt Nam phải lên tiếng ngăn chặn. Ngày xưa các cụ mình 2 bàn tay trắng đánh Mỹ, đánh Pháp có phải cứ trước khi đánh là có bạn giúp đâu, cứ đánh đá rồi thì bạn sẽ tới giúp ta. Còn phương Tây họ tổng kết rồi, ngoại giao mà không có sức mạnh quân sự thì vô nghĩa. vinhnx và Lão Vô Vị thích bài này. Ông bạn nên đi đến những gia đình có bà mẹ VN anh hùng, chất độc màu da cam, những người con mất cha, người vợ mất chồng, gia đình ly tán để hiểu hết thế nào là chiến tranh, thế nào là sự quý giá của giây phút hòa bình nhé. Còn 1 cơ hội dù là nhỏ nhất cũng phải tôn trọng và giữ gìn hòa bình. Nói chung bạn cần nhìn nhận thực tế khách quan, mình không quan tâm đến nhà Thanh GDP bao nhiêu, cao hơn Anh, Pháp thời đó bao nhiêu lần mà mình đang nhìn về thực tại. GDP đầu người của nó cao gần gấp 3 mình, tổng GDP cao hơn mình khoảng 50 lần, trình độ khoa học của nó hơn hẳn ta. Vậy với tốc độ phát triển như hiện tại thì sau khoảng 15 năm nữa, GDP của nó gấp ta 100 lần. Với nền kinh tế mạnh như vậy thì vũ khí của chúng so với ta sẽ thế nào? Phải nói rằng nếu có hải chiến, ta thua 90%. Bạn mong chờ vào nước ngoài? Bài học Hoàng Sa 1974 chớ có quên. Chả biết bạn đang suy nghĩ gì mà phát biểu về bài học 1974. Qua đây tôi cũng muốn đưa ra cho bạn 1 hướng mới về cách suy nghĩ. 1) Hải chiến Hoàng Sa, Hải chiến Trường Sa cả Hải quân 2 miền đều bỏ của chạy lấy người. Hải quân Việt Nam Cộng Hòa có khá hơn Hải quân nhân dân là còn bắn cháy tàu địch, còn Hải quân Nhân dân thì chỉ biết ủi tàu lên bãi cạn và vác thân tàu ra làm bia tập bắn cho địch. Nếu đánh thẳng cẳng thì ta cũng thua nhưng quân địch cũng thiệt hại, đặc biệt ở trận Hải Chiến Hoàng Sa nếu Hải quân Việt Nam Cộng Hòa đánh có khi còn thắng. 2) GDP đầu người, GPP đều chả thể hiện gì sất. Cái thể hiện sức mạnh của 1 quốc gia là ở các yếu tố sau: Dân cư, tình trạng dân cư, khả năng sản xuất hậu cần, khí tài quân sự, tướng lĩnh, kỷ luật quân đội và quan trọng nhất là trình độ lãnh đạo. Trung Quốc ngày nay ngoài trình độ lãnh đạo ra các phần khác đều chỉ trên mức trung bình, riêng trình độ lãnh đạo của họ thì thật là tuyệt vời. 3) Thực tại nào cũng do những quy luật lịch sử quyết định. Thế giới có thể cấm vận nước Nga nhưng người Nga cũng không ngại đưa quân vào U. Thực tại thế giới hôm nay đấy. Nếu người U không tự phân rã mình, không từ bỏ vũ khí hạt nhân, nếu lãnh đạo của U không tư lợi riêng thì liệu nước Nga có khả năng đưa quân vào U, chia cắt đất nước khiến U chìm trong viễn cảnh tối tăm như hôm nay không? 4) Một thế hế mới ở Việt Nam đang bắt đầu nắm quyền, những người trẻ, trung thực và thẳng thắn đang thay thế các lãnh đạo già, ít học. Mình tin rằng thế hệ trẻ ấy sẽ quyết định vận mệnh của dân tộc. Nhưng cần phải hiểu rằng, người Việt Nam muốn tồn tại không thể chờ giặc đến nhà, để đàn bà cũng ra đánh. Phải tích cực, chủ động nắm thắt lưng địch mà đánh, phải tấn công chúng trên mọi mặt trận từ văn hóa, kinh tế lẫn tư tưởng. Nếu cần thiết chúng ta phải chấp nhận từ bỏ các nguồn lợi kinh tế tạm thời, từ bỏ thị trường nông sản, khoáng sản, nhưng phải đánh, nếu không đánh thì nước Việt coi như đã mất. Cái bạn vừa nêu chẳng liên quan gì đến cái bạn trước đó. Bạn nói Việt Nam sẽ có đồng minh để đánh bại TQ, nhưng bài học Hoàng Sa 1974 cho thấy đồng minh ruột đã bán đứng VNCH thế nào. Ý của tôi là ta phải tự lực cánh sinh. Nền kinh tế mạnh có ảnh hưởng đến chất lượng quân đội và cũng là thể hiện của chất lượng dân cư. Bạn có 10 máy bay, tôi có 100 máy bay, cho dù bạn chỉ huy giỏi hơn tôi, nhưng liệu bạn thắng được tôi? Tôi thấy bạn hay dẫn chứng nhưng bạn cần sự thực tế bởi các sự kiện đã và sẽ diễn ra có thể sẽ khác nhau nhiều. ngồi chờ từng ngày bắt đầu cũng thấy nhàm nhàm chán chán r đấy nhỉ ?! Chả biết các lãnh đạo tính làm sao đây ? Nếu nó cắm ở đấy 30 ngày rồi rút về.....thì sao? sau đó hòa cả làng à ? ....khiêu khích VN lấy cớ phát động đánh chiếm đảo ?? ....phép thử và thử cái gì ?? ....lâu lâu rảnh rảnh lại cắm chỗ khác, rồi chỗ khác>>>>ko đuổi đc dứt điểm dần dần kiểm soát đc lưỡi bò trên thực tế ?? hay là thế nào các bô lão nói cho em thông với. Nó xâm lược rành rành ra đấy, các bô lão tính sao ??? Yêu Lịch Sử thích bài này. Hiện tại ta chưa đánh được chúng, mà thế giới vẫn coi ta và chúng tranh chấp với nhau, không biết đến chính nghĩa của ta nên không hoàn toàn ủng hộ ta nếu chiến tranh với Trung Quốc. Theo tôi, ta nhịn chúng, hãy cố gằng phát triển kinh tế làm sao nhanh hơn chúng để có thể thu hẹp khoảng cách giữa hai nước. Ngoài ra cần kiện TQ, nếu ta thắng, ta sẽ có chính nghĩa để chống lại TQ và khi ta có chính danh, ta sẽ được quốc tế ủng hộ mạnh mẽ nếu có chiến tranh với Trung Quốc.